As basketball coach at Texas Tech, Bobby Knight drew a lot of criticism for his blunt statements. But he had nothing on the school’s football coach, Mike Leach, who blames his team’s loss this past weekend on the adulation the players get from “their fat girlfriends.” Hmmm . . . he has a point. Gotta admire the guy for refusing to apologize to fat chicks (and his players’ concubines). And the Red Raiders gridiron coach gives dating advice, too. Watch the mildly amusing videos, below. Oh, and by the way, I don’t think there’s a word, “conversate” (although I just looked it up and I guess this improper English is now considered an accepted slang–thanks, Ebonics!) I believe it’s “converse.” But I guess they don’t hire football coaches for their vocabulary. If his football strategy is as well thought out as his dating strategy, it’s no wonder his team lost. I guess skinny little girl friends serve as a source of encouragement and support that promotes wins. If fat girlfriends cause a team to lose because they are fat then I guess fat football players are also a cause. Leach fails to understand the connection. If a football player is fat he will probably have to date like kind girls. The team loses not because of the fat girl but because the fat guy was not in football shape. Hey, he might be on to something here. You could set betting lines on the weight per inch average of all the palyer’s girl friends! What an edge! Do thin girl friends promote nbetter player conditioning? What happens if the school provides the fat girlfriends weight mangement and has them lose weight? Does this stimulate better player conditioning? Mmmmmm, I’m speechless! Likely he is really out of touch these days, don’t know many young ones who would be coming home from a drive-in wanting to do sum-tin on the computer during the middle of the night. Give that man a sign !!! I think y’all are missing the point so far. First, we call Leach, TSO for the strange one. He was making a point that the players shouldn’t have been listening to their friends or reading the press clippings about how good they were after beating Nebraska in Lincoln. I believe that fat girlfriends was a metaphor more than anything else because they have some pretty hot girlfriends. And he was right about that them because the team did not give much effort and in a rivaly game you are always going to loose it if you don’t. We were 21 point favorites playing at home. 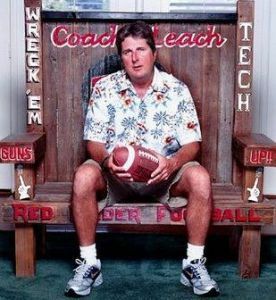 However, Leach’s coaching leaves much to be desired. Btw Debbie, while he is a lawyer he has always been awkward with his public speaking. Though he is much better 10 years later, but he lack of skill in speaking has him frequently putting his foot in his mouth. The media here doesn’t have the guts to ask him the tough questions and so he continues to spill these Leachisms. Whoa – has this guy been fired yet? You can NOT make fun of fat people anymore. You can only make fun of religious, skinny, straight white males. Make that religious, skinny, straight white Southern males. Love it – you tell them Coach. It is well documneted all chicks in Lubbock are fat, otherwise they would be in Austin, so he was talking about all of the players girlfriends. Horns baby. Watch out for that wall. 9-3-94 Double T. – RIP. Fat girlfriends aside, a lot of us here in Clemson wanted him as coach. Double T, Leach insulted the aTm players girlfriends first. The opposite is true. It is well-documented that the chicks going to Texas Tech are a lot better looking than the ones going to Texas University. Austin’s “chicks” are quickly going the way of Houston and San Antonio, and that is obese. And it is pretty low class that you would make fun of a horse dying in an accident. Finally, Clemson can have him. I won’t be PC, I bet they are a bunch of fat white girls dating all the black athletes. Go to any college campus and it is the same way. Some fat white girls fighting it out with black girls for the black athletes. I always find it hilarious about how they are get played or playing the guys to get pregnant. Hoping for the chance they can be the babymama of an athlete’s illegitimate child. Didn’t they make a movie about this? Leach was implying that the players let their egos get stroked too much ended up playing crappy because they had their heads filled with how awesome they were instead of focusing on the actual game. It really had nothing to do with their actual girlfriends and wasn’t even directed at them. It was directed to his players because they need to get their heads out of their asses and focus on the game. And I wouldn’t trash him for not saying a single word in it’s correct form, he has a law degree. How high of a degree do you have? Go TECH! Is it possible he meant “phat” little girlfriends?